Hi guys, I don’t know do you use this free Notepad++ editor or not, but I found it very friendly for me. So, what this all about – you may use your desire style configuration, as an example it will be the C++ here, and you want to auto pick this style for your HLSL shaders, you know that they have typical .ps file extension. Move to Style Configuration in Settings. 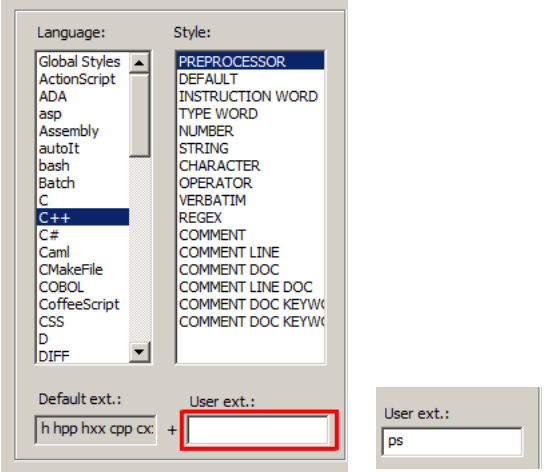 Choose you desire Language, as I pointed above, let it be C++, and add “ps” in User ext. (without quotes). You can add more extensions separated by a space. OK, now save and close. Try to open the .ps file with Notepad++, you should open the file with the chosen style automatically BUT THIS DOESN’T HAPPEN. Why? The problem is that Notepad++ already have this extension “ps” attached to PostScript files and you need to exclude this var. To do this just open %APPDATA%\Notepad++ location folder, specifically langs.xml. Find this line name=”postscript” and near you can see the ext=”ps” – this is what we looking for. You may change here the “ext” property “ps” to other, whatever you need or you can delete the postscript language at all. Select all the text from Language name=”postscript” to close </Language>, delete and save lang.xml file. That’s all, now you can open the .ps files with chosen style. This entry was posted in abuse and tagged hlsl, notepad++, shaders by admin.